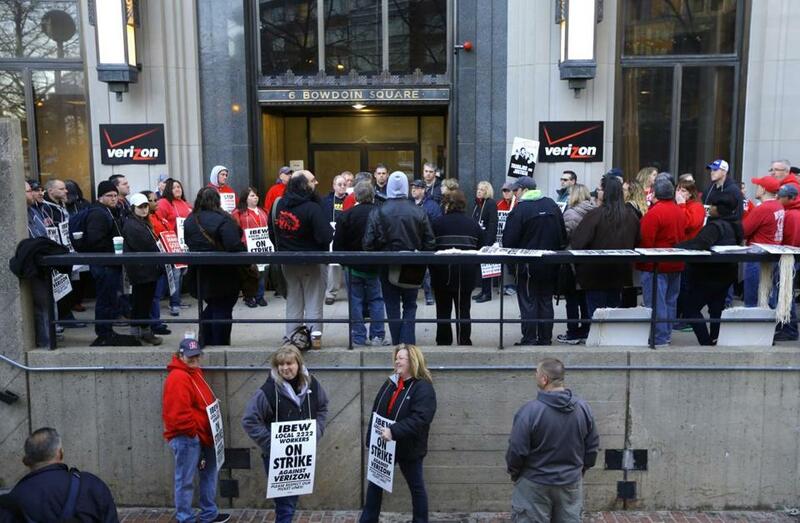 Verizon workers went on strike Wednesday along the East Coast, including Massachusetts. Picketers were seen outside the company’s offices in downtown Boston. When 36,000 Verizon employees walked off the job Wednesday, the action represented one of the biggest work stoppages in the country since the last strike at the telecommunications giant in 2011. The workers’ aggressive stance reflects the turmoil in an industry undergoing rapid technological change while its veteran workforce fights to protect its jobs. The striking workers, including about 5,000 in Massachusetts, are repairmen, installers, customer service representatives, and other East Coast service workers for Verizon’s wireline business, which provides land-line phone and FiOS service. The action came a day after Verizon announced a $300 million investment to bring high-speed fiber-optic FiOS Internet and TV service to Boston. The workers, represented by the Communications Workers of America and the International Brotherhood of Electrical Workers, have been without a contract for nearly eight months. The unions say Verizon wants to freeze pensions, make layoffs easier, and rely more on contract workers. The telecom company has said there are health care issues that need to be addressed for retirees and current workers because medical costs have grown. The company also says it wants greater flexibility in managing its workers. Myles Calvey, business manager for IBEW Local 2222 in Dorchester, said the technicians on strike are highly involved in new technologies, including maintaining fiber-optic networks and upgrading streaming services. Bringing FiOS to Boston will further increase demand for their services. As the rate of union membership nationwide has declined, from 20 percent of the workforce in 1983 to 11 percent today, strikes have become increasingly rare. Last year there were 12 major work stoppages, involving 47,000 workers, according to the Bureau of Labor Statistics; in 1970, there were 381, representing 2.5 million workers. Public support of unions has declined in recent years, although Democratic presidential candidate Bernie Sanders was quick to join workers on the picket line in Brooklyn. Verizon, which generated a $17.9 billion profit last year, is the country’s second largest telecom company, after AT&T. Each Verizon contract has chipped away at long-established benefits, said Keith Bonasoro, a 19-year veteran who was among the approximately 100 Verizon workers picketing in Bowdoin Square Wednesday. Job guarantees, pension plans, and free health care benefits have all gone away, he said. All 160 wire-line Verizon locations around the state are on strike, said Calvey, of IBEW Local 2222, and customers who need installation or maintenance should be prepared for disruptions. Verizon said that the company has trained thousands of nonunion workers to fill in for striking workers, and that employees from other departments will be sent to replace striking workers. 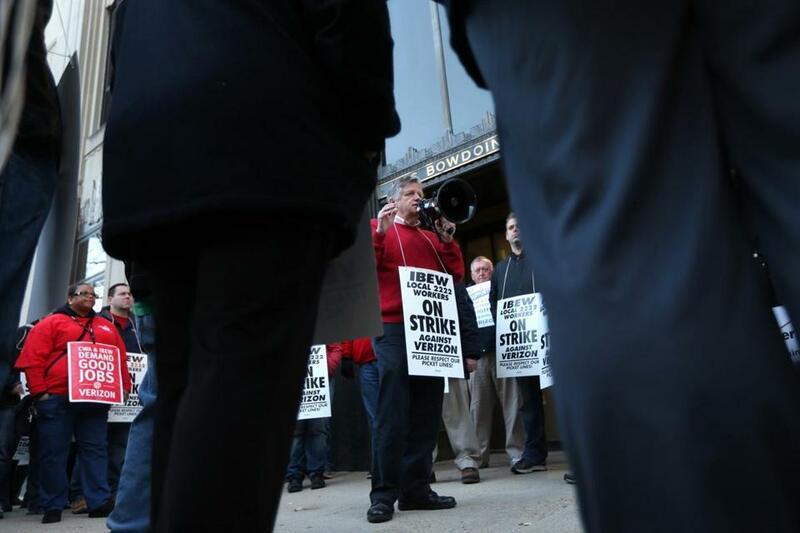 ‘‘Let’s make it clear, we are ready for a strike,’’ said Bob Mudge, president of Verizon’s wireline network operations. The company did not respond to questions about whether customers experienced service disruptions on Wednesday. The majority of Verizon Wireless workers are not part of the strike, although one organized location in Everett is participating in the work stoppage, and the union is picketing other wireless locations. Scott Garland, a central office technician who works on network equipment, was picketing with other technicians Wednesday morning in Milton. He said Verizon’s proposals would hurt longtime workers and customers, as the company turns its attention to newer technologies. Miles Calvey with IBEW Local 2222 spoke through a megaphone in front of Verizon’s downtown Boston offices. About 39,000 members of the Communications Workers of America and the International Brotherhood of Electrical Workers in nine states, including Massachusetts, and Washington, D.C., have gone on strike amid a contract dispute with Verizon. Material from the Associated Press was used in this report. Katie Johnston can be reached at katie.johnston@globe.com and on Twitter @ktkjohnston.